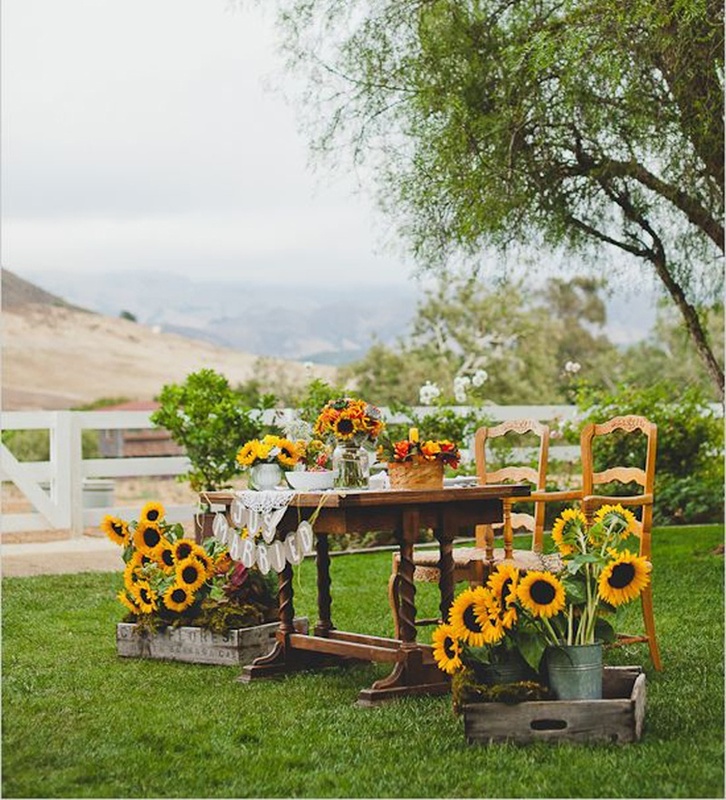 #SummerWeddingSeries – Fresh Ways To Use Sunflowers In Your Wedding Decor! What is a wedding without flowers? We discovered an amazing way to add a twist to the usual wedding flower décor. We’re all used to the saints of wedding flower décor AKA white carnations and lilies who seem to dominate every summer wedding scene. But why not put a twist on things with a pop of yellow? You guessed it! Sunflowers. Vibrant, fresh, young – they are a perfect translation for a young couple in love. We did our little bit of research and found out just how versatile these bright sunshine-y flowers could be. Turns out, they’re perfect for an outdoor contemporary rustic feel and can be used from table centerpieces to invitations to cakes also! Scroll down to discover a world full of bright yellows that will make your wedding day as bright as the sun. P.S – Don’t worry about the availability of these yellow hued beauties, there are plenty of artificial sunflowers which will surely do justice to your wedding! Jazz up a simple white buttercream wedding cake or a naked cake with some fresh sunflowers OR opt for lemon butter cupcakes for a cutesy feel at your wedding. Wooden planks or black chalkboards always do justice, we think – but that bright shiny sunflower will definitely up the pretty element at your wedding! Want to make all your wedding guests pull out their phones and instagram your gorgeous table setting? Bunch together sunflowers or pair them up with fresh green ferns and glass lanterns for a rustic-country feel. P.S – don’t forget to match your napkins to these yellow hued beauties. From arches to bridal bouquets to sunflower topiaries – there’s just so much you can do with this gorgeous flower! Glam up those stunning chivari chairs with sunflowers or add a touch of elegance with single flowers and vintage lamps – one way or another, your wedding is going to stun!